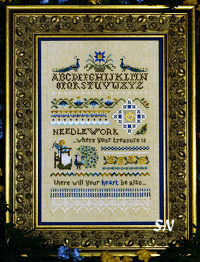 Victoria Sampler has beautiful, delicate, and sometimes very intricate designs. She blends colors beautifully, and challenges you with a wonderful variety of hardanger, pulled thread embroidery, and lots of cut and drawn work, too. Always a touch of silk ribbon, always special silks and threads, her instructions and leaflets are beautifully done. Thea offers classes on-line for her designs... a great help if you're not sure you're on the right track with something! The details for "Cyber-classes" are right on the leaflets! 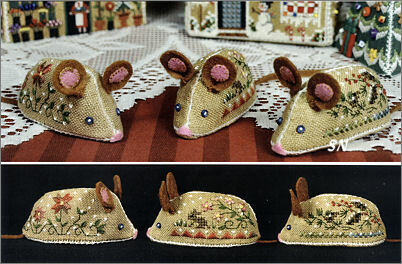 This is a triplet of tiny stitched and stuffed little mice! (They remind me of Twinkies!!!) Stitched on 28ct hand-dyed Picture This Plus Gingerbread Linen, each mouse finishes to approx 1-1/2 x 3 inches in size. Worked in silks with a few specialty stitches, they are garnished with micro-button eyes and two-tone felt ears. The leaflet includes a page of assembly steps with pictures which will be VERY helpful with the finishing. Stitching is actually pretty minimal... they are darling! Offered as the leaflet with accessory pack of threads, felts and buttons. A charming winter cottage totally decked out for the season!!! Stitched on 32ct Smokey Pearl Linen, this finishes approx 5 inches square, and is shown in a frame that fits the Mill Hill button & Bead kits! The accessories packet contains the silks, and lots of specialty beads and buttons! Finishing 4-1/2 x 14 on 28ct Clay linen, this is loaded with specialty stitches all worked with numerous solid and hand-dyed silks and garnished with cream and gold glass beads. They have beautiful stitch diagrams and charts in here, along with some great close-up stitching pics... stitch just a few parts or the entire sampler. This is a pretty summertime sampler design. Presented TWO different ways... the stitched piece is the same for both, but VS has offered the PILLOW with sunflower hardanger and sunflower finishing as an alternative option to the framed piece. Notice COTTAGE is the PILLOW finishing; STREET is the FRAMED version. 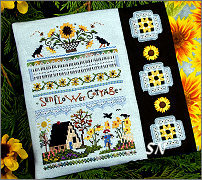 Finishing 4-1/2 x 7 on 28ct Ice Blue Linen, the sunflowers all feature silk ribbon embroidery. Lots of fun specialty stitches... a little cut and drawn thread work. COTTAGE is the complete kit of linen and ALL the finishing materials. 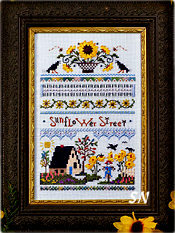 STREET is the sampler with silk thread packet. 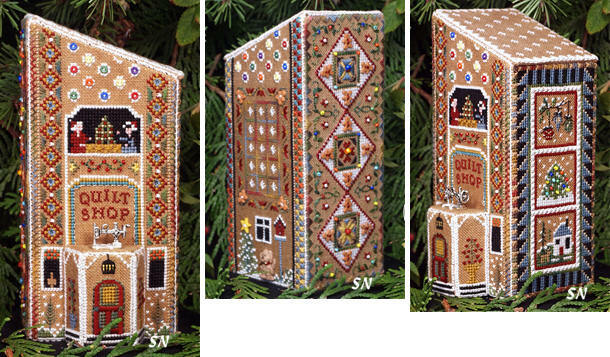 Victoria Sampler has another charming stitched gingerbread house pattern... this one is a little simpler in construction than some of the others... but just as cute. Offered this time as a COMPLETE TEACHING KIT of chart, all the threads (silks, perles, ribbons, cottons), embellishments (tons of beads and buttons), both fabrics -- the hand-dyed Gingerbread 28ct and Dark Teal Green Cashel linen and layouts for stitching and cutting. Along with all this, Thea has a YouTube channel you will be invited to join where you can participate in the 'class' and stitch-along! Joins the Tree, Stitching House, Church, Candy Cane Cottage, Bakery, Haunted House, Needlework Shop, Quilt Shop, and Retreat Cottage. She describes her new Flower Shop as 'positively European with its striped awnings and colorful floral display in front of the shop.' Along with the potted Christmas Tree and the shopkeeper bringing out a flat of forget-me-nots, there are more staffers planting out back. Lots of specialty stitches (the silk ribbons do well in the flowers! ), each side of the shop is different. The entire building finishes approx 5 x 7 in size. The price is 'a little infortunate' this time around... I guess it's the addition of the fabrics and the whole stitch-along thing... but this IS cute, and worth a look! Here's something to stitch to celebrate ANY occasions you want! Thea has included alphabet lettering to change the Happy Birthday line... so think about changing that. This is full of fun color and special threads. It finishes approx 3 x 16 on 28ct. Make it to hang each time someone in the family has a birthday... or graduation... or promotion... or a good grade on a test! Just a real different theme for a sampler, it'd be fun to document special dates on the backing paper of the framed piece! Presented as the leaflet with thread/embellishment pack. Two more pieces to their Stitched Gingerbread Village! Pieces Nine and Ten: A Stitching Retreat Cottage -- ONLY 3 x 4 in size -- and The Village Tree -- just 4-inches high! 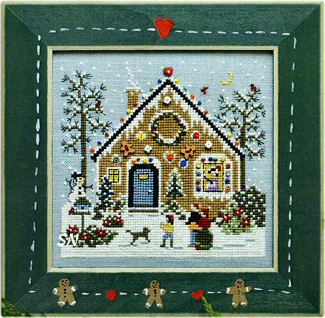 Joining the Needlework Shop, Bakery, Candy Cane Cottage, Tree Etui, Church, Stitching House, Quilt Shop and Haunted House, this charming 3 x 4-ish house is trimmed with tons of buttons, some beads, and lots of your pretty stitching. The Hardanger roof is the dressing on the cake! Leaflet has pattern layout of fabric, nice clear charts, the accessory pack contains all the silks, beads and buttons. All you need is the linen and #8 and #12 Pearl for the Hardanger on the roof. 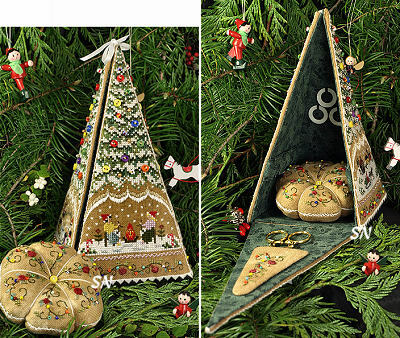 Village Christmas Tree -- What a cute accessory for your growing village of miniature stitched houses! White and green scallops of stitches make your greenery! 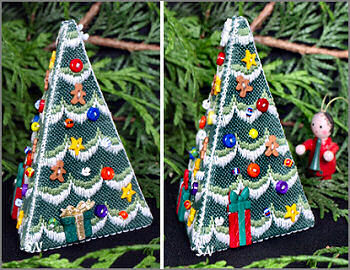 Your tiny tree finishes approx 4 inches tall on 28ct -- it's about 3 inches wide at the bottom. Presented in leaflet format with great charts and clear finishing instructions, the accessory pack as enough 'stuff' in it to stitch all three sides of one tree. 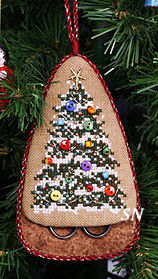 The stitching is a simple Satin -- Bargello-type -- you are seeing all the buttons and beads on there as the ornaments! Thea tells you that you CAN choose some different colors of green linens, to make a little forest of these!!! Just the cutest thing, your trees could be ornaments, they could even be a cover for a bit of candy! Presented as a leaflet with accessory pack. If you are a Victoria Sampler Fan.. here are two new offerings full of specialty stitches and beautiful silks and metallics. Stitching Under the Oak -- This is a three-piece set of pocket case, scissor case and pin keep. Pretty silks, lots of lovely pattern detail and awesome specialty stitches... you also get 6 gorgeous pages of exquisite finishing instructions -- complete with 37 (THIRTY SEVEN) actual photos of the construction process!!!!! It's not hard.. this just insures that yours turns out like the book sample! Sister Sampler -- Thea's classic band sampler concluding with a band of Hardanger Embroidery down at the bottom... some stitchers break these all up and make a set of pin cushions from all the sections of the piece. This one is perfect to 'disect' into a medley of pink and lavender silks! 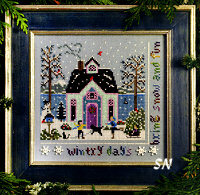 The Victoria Sampler has sent a charming design -- kind of a miniature version of their 4 seasonal Cottages by the Sea. *Happiness is a walk on the beach. 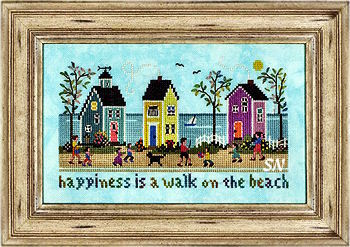 * A trio of happy beach houses are nestled on the sand, with a path running across the front yards. I imagine there is more sand behind them before the water... ? Thea's charming set of seasonal cottages is finished, and this one just seems to coordinate so beautifully with them. Stitched on any light blue linen you want, the model is on 28ct and finishes approx 8-1/2 x 5 inches in size. Presented in leaflet format, the accessory pack contains all the three different brands of silk threads needed and black bead embellishments. Very colorful and pretty! Anyway, special stitches, lots of luscious threads in the embellishment pack, choose just about any light blue fabric to stitch this onto... the whole series has been colorful, full of texture, and charming! 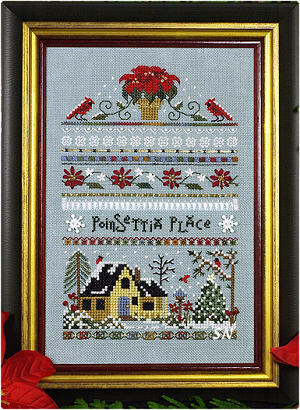 The Victoria Sampler has a new piece that celebrates Poinsettia plants we love during the holidays. The quiet cottage scene at the bottom is charming by itself... and actually, so are the top bands of flowers -- you could split this into two pieces! Worked on Smokey Pearl 28ct, it finishes approx 5 x 7 -- just a BITTY thing! Some of the flowers are stitched with silk ribbon -- not threads, and tiny glass beads are featured in the centers of all of them. Lots of special stitches in this, and those pretty Lazy Daisies with the silk ribbon. One of Thea's long skinny band samplers, this one celebrates the Christmas Daytime schedule! It begins with Santa's sleigh ride visit... then the living room in the morning, when you get to open your stocking. Church is next, and a quiet walk afterwards... then dinner! Between all the scenes are borders of special stitches, and as always the included instructions and pictures are huge and easy to follow. 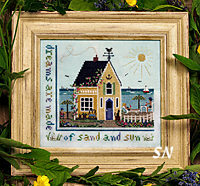 Victoria Sampler's 3rd seasonal beach house has arrived... I don't think of Halloween at the beach, but I guess it DOES happen! 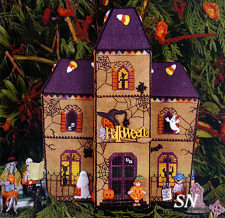 A petite purple house with that witchy-green front door and charming pumpkin garden... I'd like to live there! Finishing 6 x 6-ish on 28ct, there are only a few special stitches in here, but lots of colorful silks and a trip of pumpkin buttons for the border. Presented as the leaflet with silk and button pack, this whole set of cottages has been so well received. Some are stitching them all on one piece of fabric, some are not and skipping the borders as well. 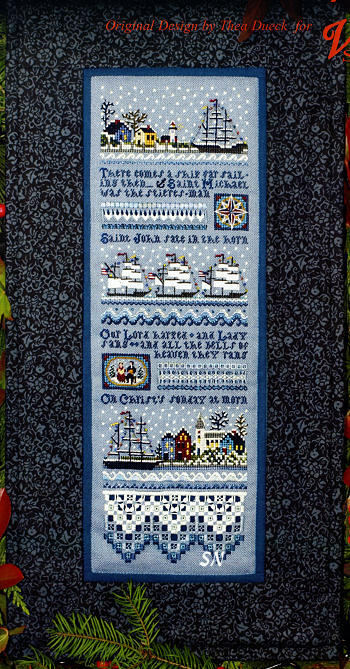 Victoria Sampler is on design #2 of her 4-Seasons of charming cottages by the water -- Winter Cottage joins Beach Cottage released last year. Stitched on 28ct Smokey Pearl Cashel linen -- a light neutral gray -- the silks are all the more colorful against that wintery-sky-background. 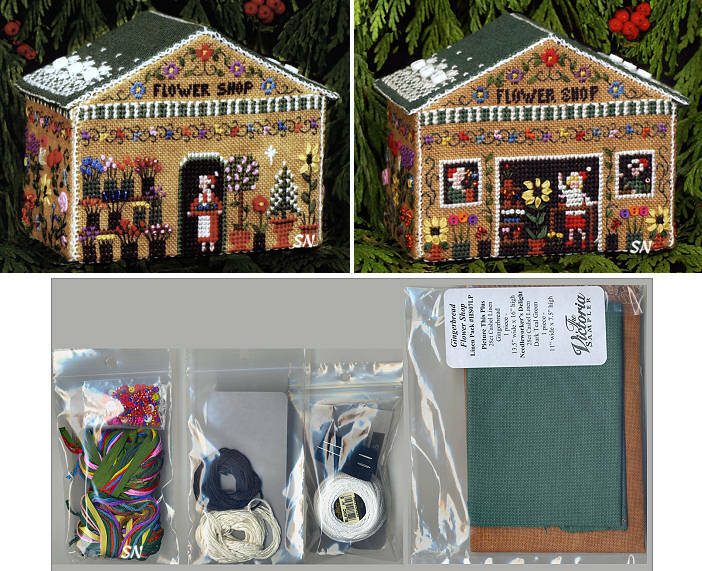 Gloriana, Dinky Dyes and Needlepoint Inc silks -- some hand-dyed -- the thread packet also includes 4 snowflake buttons for garnish. 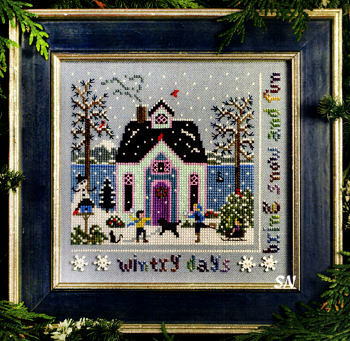 The delightful cottage finishes approx 6 x 6 and features a few special stitches like Lazy Daisy and Plaited (looks like woven pie crust topping - you can see it in the window woodwork.) 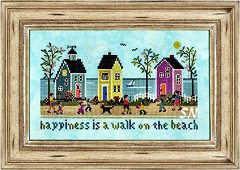 Stitch it with or without the verse border, you can see that on Beach Cottage as well. So cheerful, this is offered as the leaflet with silks and flakes separately. Needlework... where your treasure is there will your heart be also. This is a pretty piece -- 6 x 10 on 28ct Clay Cashel Linen -- that DEFINITELY showcases your stitching talents! Loaded with luscious teals, turquoise, cobalt blues, aquas, mossy greens, golds and cream silks and metallics, I think the only Cross Stitches are in the girl. Hemstitching and Hardanger -- yes, there is cutting in the middle of the piece, Thea's peacock tail feathers are over-one explosions of color. Neat Flower Eyelets in here... it just looks incredibly wonderful to stitch!!! The pattern also provides detailed finishing instructions to make your sampler into a fabric needlework tote bag -- showcasing the sampler on the front. 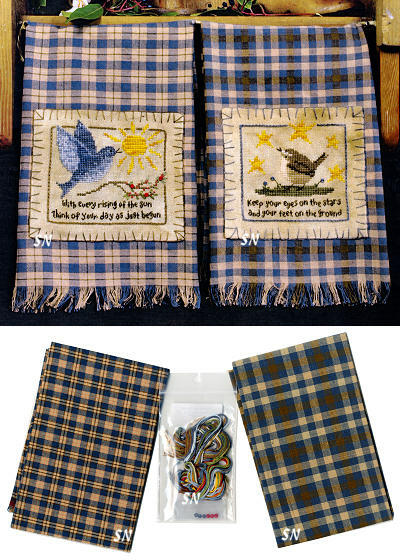 The leaflet and threads (beads and charm are included in threads packet) are offered separately, as well as linen and that possible tote bag material. 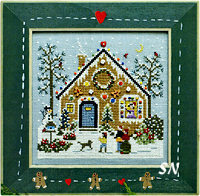 Part eight of Victoria Sampler's charming stitched Gingerbread Village is here! Joining the church, tree, cottages, bakery (and even a haunted house which kind of snuck in here! ), is a new Quilt Shop. Truthfully, we aren't enamored with the shape of this shop, but it might make a nice 'transition piece' in your village arrangement. TONS of stitching and design detail in here, you'll notice that the front door is actually a separate little sticky-out area, and there are the quilters in the window above!!! 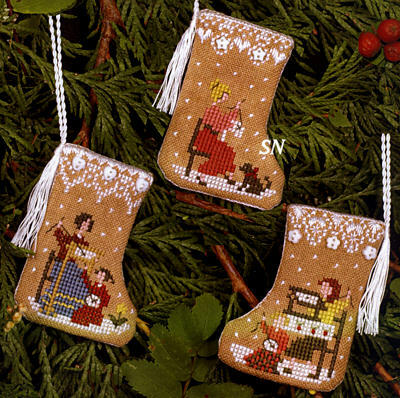 Worked on 28ct Gingerbread Linen, there are wonderful finishing instructions included in the leaflet -- 18 pics -- and great stitch diagrams. The thread/accessory packet includes all the silks, metallics, beads, gingerbread men buttons, micro buttons -- and even the little shop dog!!!! With every side stitched differently, you get pretty quilts no matter which side you see! Offered as the leaflet with Accs pack separately. You will need a piece of linen at least 14-ish x 33... we like 1/2 yard cuts better! Victorian Band Sampler -- You can stitch JUST Elememts of this!!! 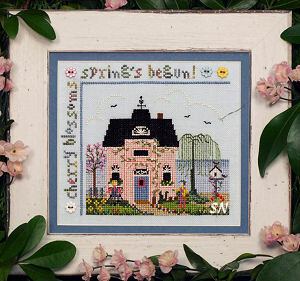 A study in pinks and greens, this band sampler is STUFFED with special stitches. I think the only Crosses in here are the letters. You might want to look at the smaller elements vs the larger sampler. The Bargello heart at the top is really cool. There is a tiny band sampler -- cute all by itself! -- to the left of the pastoral scene -- and that little scene is SO PRETTY! The flowers surrounding the verse are done in silk ribbon... then you get down to another bitty cottage with sheep in the yard... more ribbon flowers... and finally that dramatic bottom border of Bargello. So... if the skinny band sampler isn't your thing... consider all the smaller elements in here that you could stitch separately. The accessory packet has TONS (8 types) of different silks in it, beads, the ribbons... very pretty. Each scene it cute just by itself in this -- the stitcher at the top working her quilt -- the middle panel features a crow trying to steal her silk -- and the bottom scene might just be stitch group with someone working on the snack!!! Pretty textured specialty stitches throughout, everything is charted very clearly and LARGE -- especially on the lace borders -- so you can see where your needle goes next. Offered as the leaflet with accs thread and button pack separately. We LOVE this little piece!!!!! What a tiny little sunny-yellow cottage nestled on the seashore... can you see the family all sitting outside, and the little kitty by the front door?? This finishes a mere 6 x 6-ish on a pretty light blue linen, and it really doesn't have much in the way of specialty stitching. There are Lazy Daisy floral vines, but that is about it. The colors are deliciously aqua, pink and that gorgeous yellow... and the accessory thread pack is FULL of hand-dyed silks and even has a pair of starfish charms. Just so charming, this is offered as the leaflet with accs pack separately. 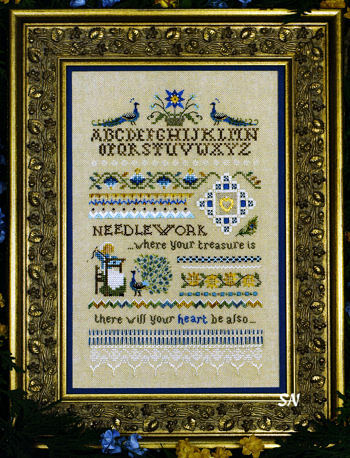 The Victoria Sampler has released a stitched needlework case that can be displayed fully opened -- as on the leaflet cover -- or folded in half like a book. 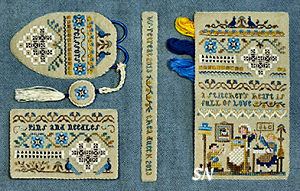 A Stitcher's Heart features matching patterns for a scissor pouch, a tiny fob, a sampler which is made into a thread pocket in this model, and a folded pin and needle case. Stitched on 28ct Clay Linen with blues, tans and golds, Thea's thread pack contains Pearl Cottons, three different brands of silks, thin metallic braids, little pearls and silver beads. Opened, like in the pic, it will finish approx 10 x 14 -- there is a wooden tray display option to hold the opened piece -- if you like that. Tray measures 10 x 14 inside... straight sides. To give you size ideas, the main sampler on the right measures about 3-1/2 x 6-1/2. The scissor sheath measures about 2-1/2 x 4-1/4. 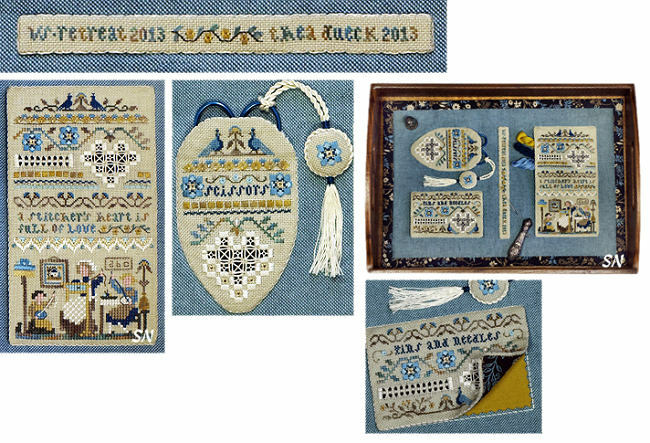 Everything is beautifully stitched with lots of fun stitches and some Hardanger. You can follow the 4 pages of step-by-step finishing instructions (with 29 photos) to make them all individually, or finish them onto the fabric board. Very different as far as finishing, you could even stitch measurement graduations on that signature band in the center! Offered as the leaflet with threads separately, this is another of Victoria Sampler's Beautiful Finishing Projects. Here is another of Thea's cute skinny band samplers for the Holidays. She begins with the sleepy town at the top, the Spring gardens of flowers -- I think the Easter Bunny is making an appearance in the center row, and finally the children hunting for their precious eggs! Stitched on 28ct Ice Blue Cashel Linen, with tons of colorful silks and a few petite seed beads, this finishes approx 3 x 17. A companion to The Trick or Treat and Happy New Year Samplers, you get lots of specialty stitches in here -- all in that 3-inches!!! Offered as the leaflet with thread pack separately. Talk about something sweet to stitch for Valentine's Day... The Victoria Sampler has re-created their famous Gingerbread Cupcakes into chocolate and vanilla for your Valentine Favorites!!!!!! *BAKE* these little sweets on 28ct Milk Chocolate or White Cashel Linen... and *FROST* them with Satin Stitches of #8 and #12 Pearl Cotton. 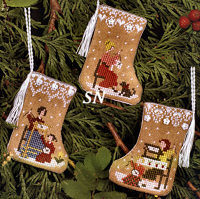 They LOOK LIKE Hardanger Embroidery -- but are only JUST regular Satin Stitches! Then, decorate each one with the charming buttons offered in the accessory pack of the Pearls AND the red silicone baking cups. 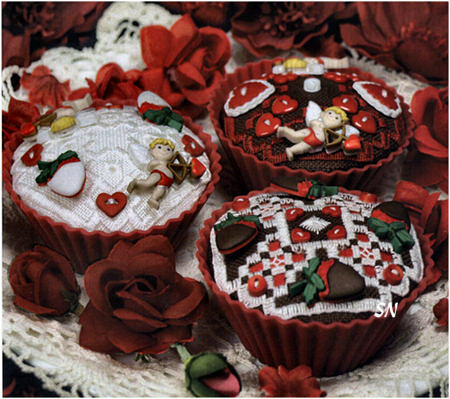 One cupcake has white chocolate dipped strawberries, the other, chocolate, while the third features tiny 1-inch cupids. These are so unusual, so charming, they are enchanting!!!!! Offered as a leaflet, the accessory pack of pearls, buttons and actual-sized baking cups is separate. Everyone will love these... especially if you display then right in the middle of a plate of real Valentine cupcakes!!!! 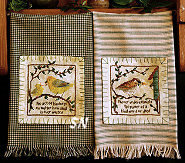 Definitely a special tribute to a unique bond between two women, this multi-stitch sampler measures approx 5 x 20 on 28ct Natural Linen. The accessory pack is full of bead and pearl embellishments along with silks and a bit of metallic. Thea has designed house #7 in her Gingerbread Village Series (We thought the Haunted House was #7... but I guess it's not technically Christmas... so it doesn't count!??) 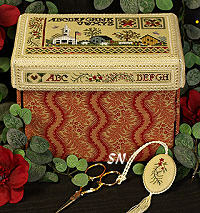 What a charming little stitched BOX! 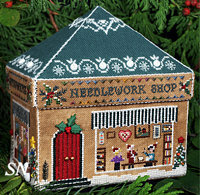 Stitched on the new 28ct Picture This Plus Gingerbread Cashel (28ct) Linen with a wonderful assortment of silks and colorful beads and buttons, this little shop finishes approx 6 inches wide, 3-1/2 inches deep and 4 inches high. Its lift-off roof add another inch to the building height. Through the 'windows' you can see the classroom activity... every side of the shop is stitched with a different scene!!! It is the CUTEST THING!!! Offered as the leaflet with super-detailed assembly instructions -- VS always prints DOZENS of actual photos in these publications so you have lots of guidance. The accessory pack -- offered separately -- has all the silks, buttons and beads. Fabric is another expense -- I am sorry to say -- so you know, this little village doesn't turn out to be the cheapest real estate in town!!! BUT... it has great curb appeal!!!!!!! We suggest a 1/2 yard piece... it'll do the upcoming Scissor Tree Ornament, as well as the Cupcakes from your extra pieces! 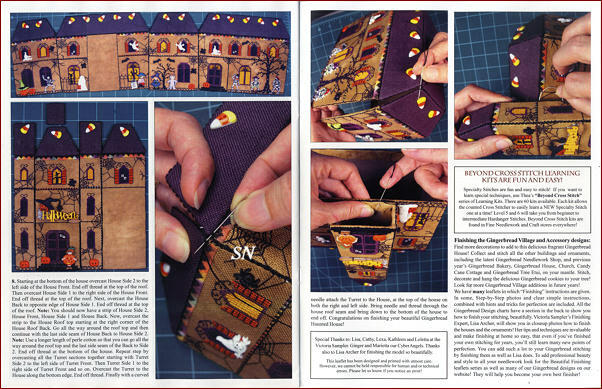 The Scissor Keep is offered in its own leaflet... stitched on a bitty 6 x 7 piece of the 28ct gingerbread Linen. The accessory pack of silks, beads and buttons is offered separately. VERY, very cute. 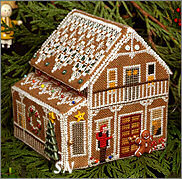 Victoria Sampler has released Part 6 of her Gingerbread Village Series. Technically, that is a Christmas Village, and this is Halloween... so don't get hung up on the 'part 6' thing! If you like it STITCH IT! If you don't want a Haunted House with your Christmas Things... that's OK too! Stitched on the NEW hand-dyed Gingerbread fabric by Picture This Plus, we are so excited to FINALLY get another option for pretty fabric for this set of designs besides the discontinued and elusive Antique Almond! But back to business -- the silks are gorgeous bright oranges, yellows, and deep purples. The buttons -- especially the little Trick-or-Treaters and the Skeletons are over-the-top! I THINK this must finish about 6 x 8. 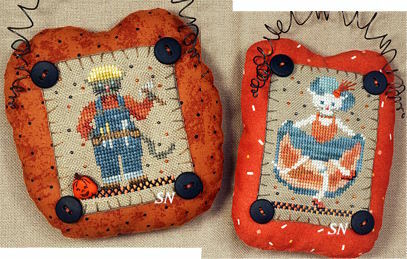 It'll definitely be a stitched labor-of-love for all the Halloween-lovers in the household!! Offered as the book with button and silk pack offered separately. 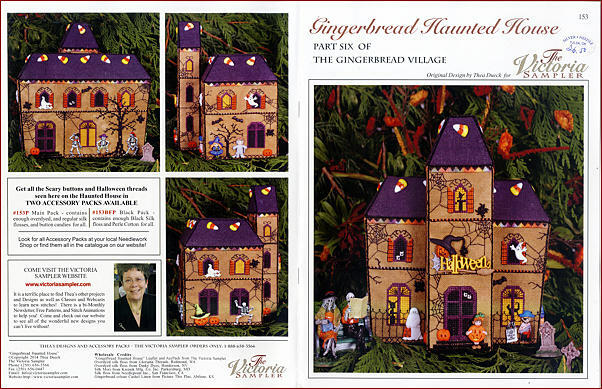 NOTE: The 28ct Gingerbread Linen has been commissioned by VS... Picture This Plus has done a WONDERFUL job re-creating the awesome color Thea uses in all her Gingerbread House buildings! So.. if your stash has been waiting for 'just the right fabric' for those houses... here it is!!! 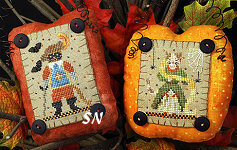 Regular Cross Stitch with a few Satins tossed into the top treatment, these are quick to stitch. Might be kind of fun to make them for everyone in the Stitch Group! Offered as the leaflet with accessory pack of the silks and buttons offered separately. Look for *Just One More Stitch* -- the companion ornanent design in the 2014 Just Cross Stitch Annual Ornament Issue! 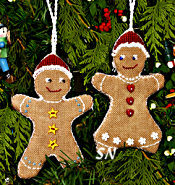 These are the CUTEST ornaments we have seen in so long... you are going to be enchanted by them! 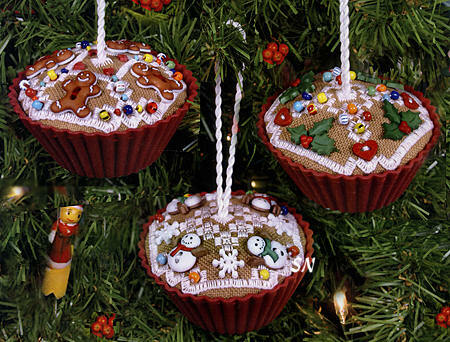 Last year's Just Cross Stitch Ornament Issue Magazine featured the Gingerbread Man Cupcake included in VS's newest leaflet of THREE stitched cupcakes! 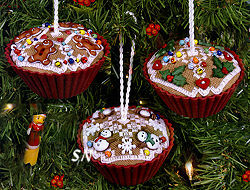 Gingerbread Cupcakes features charts for the tops of three cakes, Snowmen, Gingerbread Men and Holly Leaves, along with finishing instructions to assemble them into colorful silicone baking cups. You'll probably want the corresponding Accessory pack of all the threads, metallics, cute buttons, all the 'candy beads' and those bright red baking cups... everything you'll need except the topping fabric is in the accs pack. If you order fabric, we'll be sending you 28ct Gingerbread by Picture This Plus that is close to the 28ct Antique Almond called for (AA hasn't been available for almost a year!)... so you stitch a trio of cupcakes for your Christmas Tree -- we think these are so creative, cute, colorful, charming, unique and too pretty to eat! This is beautiful! It is a nautical-flavored Christmas sampler based on the carol 'I Saw Three Ships.' Worked on 28ct Misty blue linen with loads of silks and Pearl cottons, Thea always stuffs lots of specialty stitches and tiny details in her band samplers, and this one is no different. The tall ships have billowing sails, the rolling waves are worked with Bargello stitches, there are tiny bead touches here and there, bits of small scenes are worked over one thread, and little snowflakes dot the sky everywhere. Finishing approx 4-1/2 x 14, Thea describes this as a 'Historic Seaport Sampler.' Offered as the leaflet with separate accessory pack. 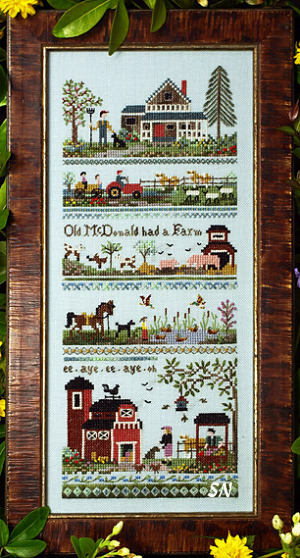 Thea Dueck has designed a seventh sampler in her Farm Series of pieces -- this one honors a simple family farm. Farmer McDonald and his family are feeding all the animals who are just happy with an ordinary day! 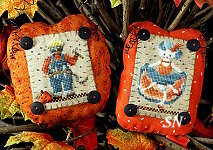 Joining Pumpkin Patch, Babe's Honey Farm, Ravenhill, Oldfield Orchard, Strawberry Fields and Jingle Bells Christmas Tree Farm, this is another 5 x 12-ish band sampler full of small design details and lots of special stitches. Worked on 28ct Ice Blue, the optional accessory pack contains all the necessary silks and bits of beads to work with. This is not coded for DMC, but if you are resourceful... you could probably choose good colors from your stash. Offered as a leaflet. Cathy Jean has a freshly hatched set of chicks for Spring! The 5th in her series of Tartlet Designs... the other 4 leaflets are pictured on this back cover, so you can see if you've missed any that you want for your set. This time... we have a mother hen, but her babies fit into SMALLER tins! 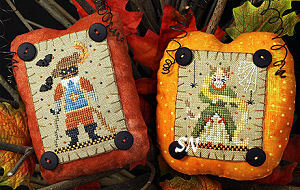 Easy stitching on 14/28ct with Gentle Art Sampler Threads, each is garnished with micro buttons. 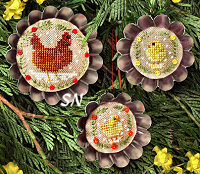 The set originally began as Christmas ornaments, so Cathy Jean continues to chart these with the two different color options -- some red buttons for Christmas greenery or buttons that coordinate with each little animal. The threads and buttons come in an accessory pack, while the tart tins come in another pack. Cute as can be! 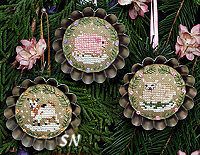 A lamb, piglet and goat, each is stitched on 28ct Dirty Cashel Linen in Gentle Art Sampler Threads. She has garnished them with micro buttons in pink and lavender... but since the first three accessory packs included red micro buttons -- for a Christmas ornament flavor -- she has also included the red buttons in #4's accs pack -- just in case you want to continue that theme. The metal tins measure approx 3 inches at the widest part of the flutes. 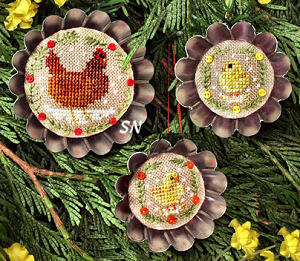 What a cute way to finish your 2-1/2 inch circles of stitching. Offered as the leaflet with thread and button accessory pack offered separately, and the tartlet tins separate as well. Here's something to stitch and display AFTER Christmas! 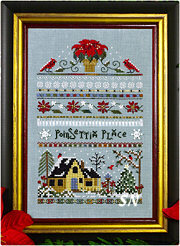 Victoria Sampler's New Year's Sampler follows a theme we never see in needlework! You get fireworks at the top... the baby new year chasing the old Father Time out of the picture! Party-goers, and the festive downtown cityscape... lots of tiny details in this 3 x 16 inch band sampler. Worked on 28ct Misty Blue Linen with an array of silks and metallics, there are also Magnifica beads to embellish. Lots of special stitches, lots of over-one detail, and EXCELLENT pictures of the bit of Hardanger worked at the bottom. Offered as the leaflet with accs pack separately. 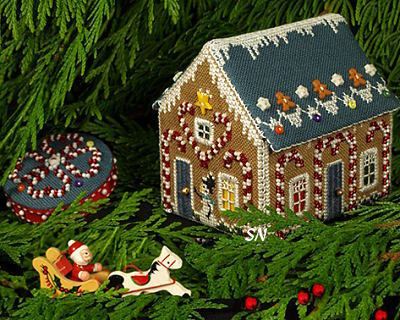 Joining their Church, Gingerbread Stitching House, Candy Cane Cottage and Tree Etui, you stitch each wall of this... even the roof, and construct the building. (The tiny gingerbread cookies on the roof are miniature buttons!) None of these are very large... our Stitching House model is something like 4 inches square and 3 inches high. Everything is offered in leaflet format, with fabric and the accessory packs of threads and embellishments offered separately. Anyway, Gingerbread Bakery is charming, and comes in a leaflet FULL of detailed instructions and great finishing photos! Well, this is a cool chart... what a fun stitching project to complete, even if you aren't doing any of the matching village. Each cookie is stitched on 28ct Antique Almond Cashel Linen in reds, whites and an icy blue. 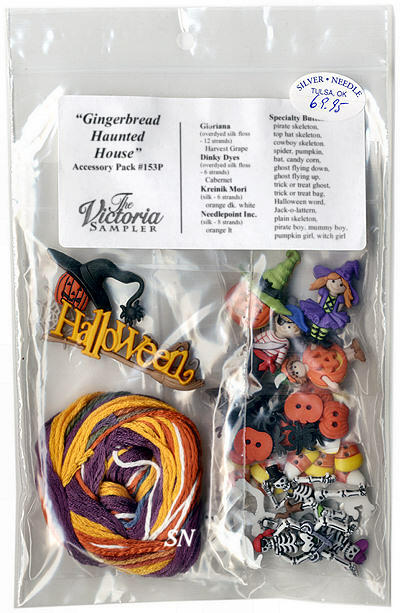 The accessory pack contains all the silks and wools, beads, pearls and tiny 'candy' button embellishments. As you can see, there really isn't much stitching on these AT ALL... so maybe after you've made your first set, you can get creative with the basic cookie shapes and add decorations from your stash to make more! 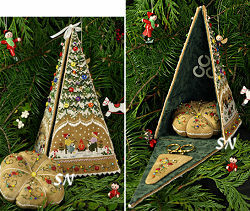 Each ornament finishes approx 2-1/2 x 4 in size. Offered as the leaflet with accs pack separately. WOW... this is a 4-sided fabric box... measuring approx 4-1/4 x 9 inches when finished. When opened, it reveals a biscornu-shaped pin cushion, but when closed... shows off four different snowy scenes on each of its sides! My gosh, just the most captivating thing... your leaflet begins with charts for each of the four tree sides. Next, the pincushion. Then, all the stitch diagrams... and finally 37 actual photos of all the assembly processes for it all! A companion to Thea's other Gingerbread pieces... the silk thread pack actually WEIGHS something, because there are so many threads and 'candy' beads and 'cookie' buttons in the pack! Enchanting! 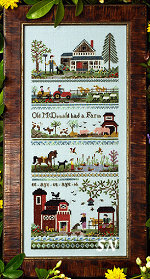 What a fun 3 x 17 inch band sampler full of teeny details! Stitched on 28ct Dirty Cashel Linen in a spectacular array of oranges, greys, black, greens and bits of yellow -- all the threads are either silks or perle cottons -- all stuffed into this tiny collage of Halloween motifs and mini-scenes. All the little Trick-Or-Treaters are less than 10 stitches high, and that haunted mansion at the top is worked over one thread. VERY nice instructions included about the Cut and Drawn Threadwork at the bottom, this is fun piece! Offered as the leaflet, with accs pack offered separately. 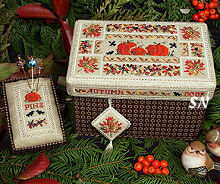 The Autumn Box... this is the 4th seasonal needlework box to stitch and finish. 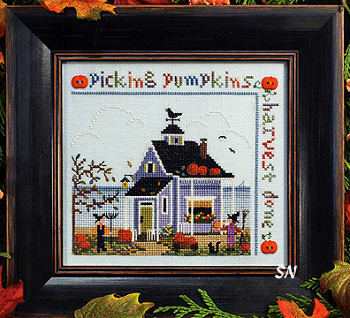 A Pumpkin patch surrounded by bands of falling leaves... the cross stitches and silk ribbon embroidery blend so well... even if you don't make this into a box top -- your needlework will still be the star attraction. The lid top are sides are fully embroidered as are the inset pin cushion tray and fob. Lovely colors of hand-dyed silks, metallics and silk ribbons, the beads are beautiful, the stitches are awesome... and the design is really pretty! The leaflet focuses on box assembly... just a minor 53 actual photos of the processes! VERY pretty... the accessory pack contains everything necessary to stitch the box pieces. Verses are stitched over one thread. Next, each is attached with primitive stitching to those pretty pieces of homespun fabric, and NOW you have a pair of towels that is simply too pretty to use, and LOVELY to enjoy! Offered as the leaflet with the pair of charts, we have the threads, buttons, metallics and pair of 18 x 22 plaid homespun fabric cuts offered separately. 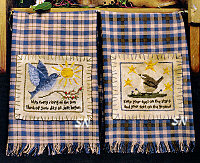 A DARLING set of designs... the vintage flavored blue, beige and brown homespun fringes easily and makes a colorful and coordinating finish for the cute little birds. 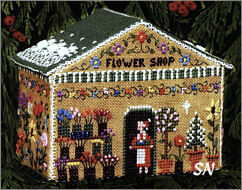 Anyway, fun specialty stitches and beads in the designs, the entire house finishes approx 3 x 4 x 5. It is worked on 28ct Antique Almond Linen using the delicious silk and bead pack offered for this book. (Get it, because it includes quite a set of little gingerbread buttons, stars, beads, and what-nots that will be impossible to find out there on your own!) 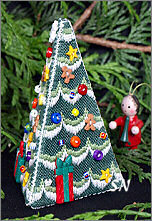 Good colors, fun stitches for texture, very unique Holiday decoration -- your family is going to notice it! Offered as the leaflet with thread pack and fabrics separate. Hey, this is cool! It's a stunning box -- the top features a TON of specialty stitches -- and that top lifts off to reveal fabric covered sides that float down to open and reveal a lined box that stores stitching tools, or whatever you want! Stitched with lots of silks, you stitch that colonial-flavored top scene, and all the sides on the top... and do all the Whitework embellishment. 8 Pages of chart and stitch diagrams. Then, since this is one of VS's Beautiful Finishing Series books... you get another 6 pages of finishing instructions with (I am not kidding) 47 more actual pics of the finishing in process!!! So... either make friends with a really good finisher... or get this book!!! So well done... it's a pleasure to page through, and dream about tackling! Accs pack contains all the silks, metallics and perles you'll need! Cathy Jean begins a new set of 6 leaflets -- just like Button Up Birdies -- only this set features 12 kitties all dressed up for Trick or Treat! By the time you've collected all 6 leaflets, you'll have 12 little ornaments ready for a spooky Halloween Tree! #1 Includes a Pirate of the Cattibean and Cattarina Kitty -- a ballerina complete with beaded tiara and gown! The pirate is too cute -- he has a beaded dreadlock -- and looks very Johnny D!!! Stitched on 28ct Dirty Cashel Linen -- 1/2 yard will do all 12 -- each finishes approx 2-1/2 x 3, and can be finished almost any way you want. There are accessory/thread packs available that include the hand-dyed cottons, silks, wire for hangers and black trimming buttons, and we have those separate from the leaflets. We're have an auto-ship on this set to make life easier, because it is so darn CUTE!